You are invited to walk the labyrinth at Church of the Redeemer in Kenmore on Tuesday December 11, 2018. "Walking with Mary and Joseph" begins at 7:00pm. If you would like to help with set up, arrive a bit early, like 6:30pm. If you have questions, contact Bee Jay Mar at labyrinth@redeemer-kenmore.org. Church of the Redeemer is at 6210 Northeast 181st St, Kenmore, 425-486-3777. The main labyrinth at Church of the Redeemer is an original design by Dan Niven. It is installed on the floor of the parish hall as a gaffer tape, semi-permanent labyrinth. 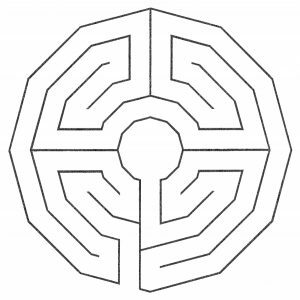 Dan has designed and installed many labyrinths in the Puget Sound region. Over the past fifteen-plus years, I’ve created many circular designs, and am also drawn to patterns which emerge out of a series of nested polygons. A common medieval labyrinth shape was octagonal with a flat base–imagine a stop sign–occasionally rotated 22.5 degrees to create on “on-point” look. I use this motif often, sometimes increasing the number of sides to twelve, creating the dodecagonal shape employed in this cruciform five-circuit design. Paths are wide enough for those using a walker. The middle is 3.5 circuits wide or about quarter of the overall width, a common ratio for labyrinths with an expanded center. Our labyrinth is named “The Twelve Apostles,” reminding us of all the adventures Jesus’ original core group experienced, walking in the footsteps of Jesus and the Old Testament wanderers. We also have a variety of table-top labyrinths for walking with a finger or with a stylus. Church of the Redeemer is at 6210 Northeast 181st St in Kenmore. The campus is a short distance north of Bothell Way, near the Burke-Gilman Trail. The entrance looks like a gravel driveway. The campus is larger on the inside than it is on the outside. And, we managed to hide a large building on the side of a hill that is not easily seen from the street.